Mikhail Grigorenko scored in overtime Friday as Quebec remained perfect through their first six games with a 4-3 come from behind win over Victoriaville. Grigorenko, who earlier helped force the extra frame with an assist in the final minute of regulation, has registered a point in all six Remparts' contests for a total of 14 (4+10) on the year. The crafty pivot dazzled with several exciting plays, including a superb blind pass from his knees in the middle period that was nearly converted. 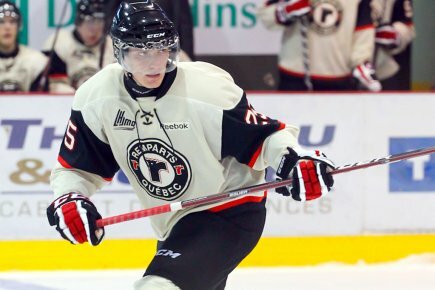 The Remparts will look to remain unbeaten on Saturday when they host Rimouski. In the WHL, Colin Jacobs scored on the power play as Prince George rode a five-goal first period to a 6-3 win over Kelowna. Jacobs now has five goals and 10 points has through his first five games to remain tied atop the WHL points leaderboard. The teams will finish their weekend set Saturday night in Prince George. Logan Nelson picked up an assist as Victoria lost a hard-fought 4-3 decision at Spokane. The Royals continue their road trip Saturday in Tri-City. Andrey Makarov got another short rest as Saskatoon got shellacked by Swift Current 10-1. Makarov, who was previously forced into relief action during his game off last week, entered in the 34th minute with the Blades trailing 7-1. He'd allow two power play goals before settling in the third period with 10 saves on 11 shots. The Blades pay a visit to defending WHL champion Edmonton on Saturday. In OHL action, Dan Catenacci set up the game winning goal as Owen Sound held off Sarnia 4-3. Catenacci stayed out of the penalty box for the first time this season en route to collecting his sixth point (3+3) through the Attack's first six games. Owen Sound returns to action Saturday versus Guelph. Justin Kea recorded his first fighting major of the year as Saginaw was blanked by Niagara 4-0. Trailing 2-0, Kea tangled with IceDogs forward Joel Wigle late in the second period. Saginaw welcomes Kitchener to town on Saturday. Alex Lepkowski logged a +1 as Barrie earned a 4-3 shootout victory over Mississauga. The Colts take on Peterborough. In the USHL, Judd Peterson finished -1 with a shot on goal as Cedar Rapids downed Fargo 5-2. The RoughRiders will play the second of five straight games at home Saturday against Youngstown. Joel Armia recorded three shots on goal in 15:55 of action as Assat dropped a 2-1 decision to the Blues. The Aces head back to the ice Saturday against TPS. In AHL preseason play, Nick Crawford scored a pair of regulation goals and then the shootout clincher as Rochester closed the preseason with a 4-3 win over Wilkes-Barre/Scranton. Phil Varone added the other Amerks goal. Rookie netminders Connor Knapp and Nathan Lieuwen split the crease duties, with Knapp stopping 15 of 16 shots before giving way to Lieuwen, who blocked 16 of 18 and another three in the shootout to secure the victory.